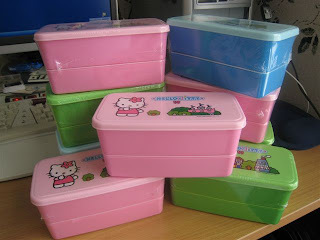 I've read in several places that the Dollar Tree had bento-style boxes. Well, it's a Saturday, Shaun's working, kids & I are staring at each other, so why not take a ride. Now, in case you're curious, I am not *that* crazy. They are not all for us. 1 pink is for Lucy, 2 pinks are for Ashton & Ryleigh, 2 greens are for Libby & Caroline, and a blue is for Stell. The other 3 are for Faith. She couldn't decide on a color and really, they were $1, so why make things difficult. We'll use them too, so it's not like they are going to go to waste. Two tiers and they all stick together fairly well. Faith and I have turned them upside down, shook them, drop them on the carpet and so far, they stay together. Now, would I put tomato sauce in one and drop it on my white couch & carpet (a la stain remover commercials)? H*ll no! But for $1, they seem to be pretty well worth it. I'm not putting mine in the dishwasher just to be safe. Can you tell me which dollar store had these? I'm in Lewisville and want to start making the kids bento lunches :) Thank you! I would also love to know any neat local places you have found to shop for goods. My mom sent me the DMN article last week(I'm in Houston)and I have to tell you I am hooked on the bento lunches! My daughter is 8 and my son is 4 and your lunch ideas were perfect for the first day of third grade and pre-school. I just got on your blog site for the first time last night and it is great with all the photos and tips. Keep them coming! I have to tell you that I ran straight to the Dollar Tree this morning to get every color of the Hello Kitty. They are soooo cute. They had a huge supply of them here in Houston. We tried 2 Target's and no luck on the Cars for my son though. I remember seeing them about a month ago at Target and thinking, "What am I going to do with these", they won't eat sandwiches and putting both the Hello Kitty and Cars back on the rack! Where do you get those adorable little panda/koala cookies filled with chocolate? and the marshmellow thingys? Thanks a bundle for all the wonderful ideas. You have motivated me to get a little more creative for their lunches. And they are trying different things! 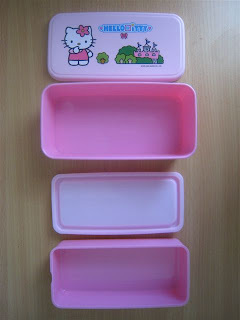 Thanks to you, I went to the Dollar Tree today and got some Hello Kitty lunch boxes. Unfortunately at this store, they didn't have any pink ones, so I bought some green and blue ones. They are perfect for $1!